ABOVE: A crowded No. 1 vaporetto on the Grand Canal. The best way to see the canal is to ride the No. 1 vaporetto from the Piazzale Roma or the railroad station in the direction of San Marco--preferably in the evening, when the daytrippers have gone home and the palazzi along the canal are floodlit or illuminated from within. If you're on one of the older boats with an open bow, sit up front; otherwise, grab a seat in the covered open-air section at the boat's stern, beyond the doors at the rear of the vaporetto's enclosed passenger compartment. As the water bus zigzags between stops on both sides of the canal during its 40-minute journey from the Piazzale Roma to San Zaccaria, you'll pass under three bridges and see dozens of palaces that were built from the 12th to 18th Centuries. Go the top of any bridge, find a place at the railing, and watch the constant stream of vaporetti, barges, water taxis, police boats, ambulances, gondolas, and other boats. Finally, if you'd like to ride a gondola but aren't willing to spend €80 or more for the privilege, you can cross the Grand Canal in a traghetto gondola ferry for the price of a coffee. 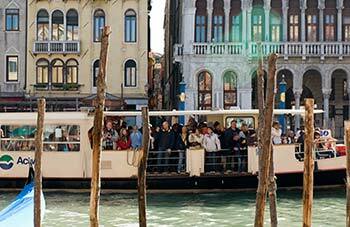 (A traghetto crossing is the cheapest transportation bargain in Venice.) Consult your map or follow the nearest "traghetto" sign to a boat landing.